In order to make things a little more exciting, we've decided to create a Challenge Thread! You may know what this thread functioned as if you frequent the AQWorlds General Discussion, but to those who don't, here are the rules and how it works. Players will give and finish challenges for eachother. A challenge can be anything, whether it's "Beat a Nightmare Dungeon Boss with a level 1!" or "Find and kill a Lepid with a Wolf-character!". Once a challenge is issued, the player responding has to give photographic evidence and issue another challenge for the next player! In case you're still confused, here's an example of what it should look like. Mritha posts first challenging: "Defeat a Worm with 100 HP remaining!". To which I would respond by giving a screenshot of the completed challenge and issuing another one for the next player to respond. Here are a few rules that go along with the Challenge Thread. Remember, if your post is found breaking any rules, it will be sent to the Purple Land of Doom aka the Trash without warning! Do not issue challenges which are too vague or difficult to understand. Simliarly, if you are confused about a challenge, request that the user make it more clear by PM'ing him/her or directly [img]http://forums2.battleon.com/f/image/pm.gif[/img] Skurge or one of the other ArchKnights to clarify. This means your challenge cannot contain a multitude number of requirements to complete. So saying something along the lines of: "Defeat so-and-so X number of times" is not a valid challenge! If for whatever reason you can't complete a challenge or believe it is too difficult, you may forfeit and leave the challenge. Users will then have to complete the most previous challenge instead and the thread will continue. However, the penalty for forfeiting is that you will not be able to accept or issue another challenge for the rest of the current page. Please remember that this thread is for issuing and accepting challenges only. All discussions of and suggestions for challeneges belong in the =OS= Challenge Discussion Thread. For your convenience, here is a format which you can use when issuing/completing challenges. All Comprehensive Forum Rules & Guidelines & OverSoul Discussion Forum Rules apply in this thread. Thanks to megakyle777 for the idea. I believe I shall go first! Here's one: Defeat an Ice Monster using a Fire character with 500 HP Remaining by the end of the duel! This is a great idea, any forum-organized events to help promote activity are very welcome! Thank you megakyle and Skurge! 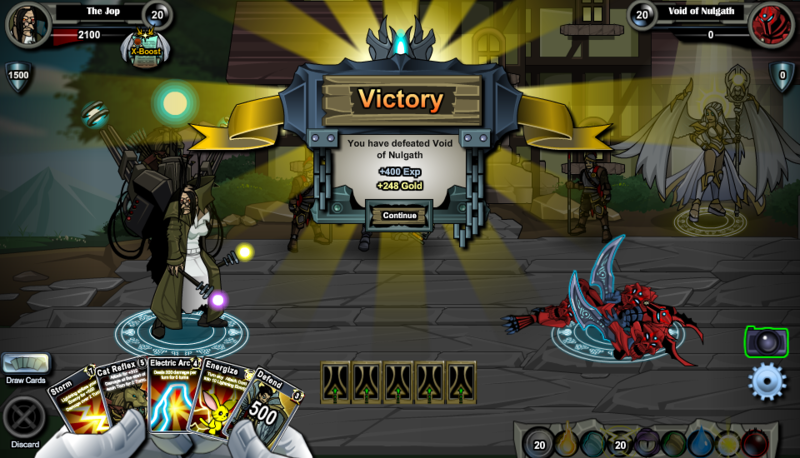 Challenge Being Completed: Defeat an Ice Monster using a Fire character with 500 HP Remaining by the end of the duel! New Challenge: Defeat an Earth monster and its shields must be 2000 at the end of the duel! Ok, guys. I think I need to clarify some things before we have more posts. No "Luck-based" Challenges! This means you can't challenge someone by asking him/her to find a highly rare character and defeat it! That being said, please realize that characters like Poison Drake, DFR, Time Gentleman, Wet-eye, etc. are rare characters. It's no fun if a challenge is dependent upon luck rather than skill. As for discussions, for now, this is a REPLY-ONLY thread - meaning no discussions! That means, unless you're finishing another challenge do not post. I will inquire as to whether or not a discussion thread should be made, but until then, no discussions allowed. Defeat an Earth monster and its shields must be 2000 at the end of the duel! Challenge- Kill an AI with the final blow being a counter. Old Challenge: Kill an AI with the final blow being a counter. New Challenge: Kill a Nightmare dungeon AI using only Catlike Reflexes. Old challenge: Kill a nightmare dungeon AI using only catlike reflexes. New challenge: Bring down an enemy Ai's HP down to -3500 or more. Bring down an enemy Ai's HP down to -3500 or more. Challenge- Kill the Fiend of Vergil Boss with a level 1 character. Have full health by the end of the fight. Challenge Being Completed: Bring down an enemy Ai's HP down to -3500 or more. New Challenge: Win with two different elements charged to 20 by the end of the fight. Challenge Being Completed: Win with two different elements charged to 20 by the end of the fight. New Challenge: Defeat an enemy with the DoT from 3-hit combos. I tried to get it right when the 50 showed but it was to quick. Challenge Being Completed: Defeat an enemy with the DoT from 3-hit combos. New Challenge: Beat Taurus with 2000 shields and 500 - 100 hp left with a level 3 character. Challenge Being Completed: Beat Taurus with 2000 shields and 500 - 100 hp left with a level 3 character. New Challenge: Charge the elements from left to right as : 1 2 3 4 5 6 7 8 9 with a lvl 20 Earth Character. You must kill the foe and have the charges as previously said to complete the challenge. Challenge Being Completed: Charge the elements from left to right as : 1 2 3 4 5 6 7 8 9 with a lvl 20 Earth Character. New Challenge: Defeat an AI Level 13 Undead monster. Challenge Being Completed: Defeat an AI Level 13 Undead Monster. Screenshot of Completed Challenge: Proof. New Challenge: Defeat a level 15 AI that has full shields. Challenge Being Completed: Defeat a level 15 AI that has full shields. New Challenge: Defeat a lvl 20 enemy with 3 shatters in the same turn. Challenge Being Completed: Defeat a lvl 20 enemy with 3 shatters in the same turn. Challenge Being Completed: Beat any boss using Cellar Rat or Big Ben. New Challenge:Defeat a lvl 20 Victor with blood rage while it has 1000 shields. Challenge Being Completed: Defeat a lvl 20 Victor with blood rage while it has 1000 shields. New Challenge: Defeat your foe with an autokill of -1000 or more. The overkill damage must be higher on your foe than yourself. Both you and the foe must have at least -1000 overkill damage when you perform the autokill. The foe must be lvl 20. Challenge Being Completed: Defeat your foe with an autokill of -1000 or more. The overkill damage must be higher on your foe than yourself. New Challenge: Defeat an AI monster over Level 15 with full HP remaining. Challenge Being Completed: Defeat an AI monster over level 15 with full HP remaining. Challenge Being Completed: Beat a legendary AI (Not Sentry Lord) with a level 8+ Cellar Rat or Big Ben. New Challenge: Defeat an(Your character can be any level) enemy using only Bloodrages and Lifedrains.